On July 31 2015 it was announced that Alexander Wang and Balenciaga had decided to not renew their contract. After three years between New York and Paris, splitting his time between two labels, the joint decision was slightly unsurprising, given the rumbling rumour mill in the weeks previous. “It’s been an incredible experience to work with a couture house in Paris. I am honoured to have had the opportunity to work with a couture house in Paris.” Providing a great experience for Wang, hopefully some of the couture-like practices back to New York to invigorate and innovate his eponymous label. On October 7 2015 a press release announced Demna Gvasalia as Wang’s successor. Gvasalia, of Vetements success, is not a favourite of mine but I’m interested to see what his artistic direction brings to the label. He has yet to prove his talent in my eyes. Wang staged his final show in a disused église during Paris Fashion Week. Going out with a bang some predicted, however the actuality was a jarring oddity, juxtaposing serene ivory slip dresses with summery street wear, and Notorious B.I.G’s ‘Going Back to Cali’ with classical music on the speakers. The San Francisco-born designer was ready to go back home, albeit his second home: New York, and focus on the expansion of his namesake label. 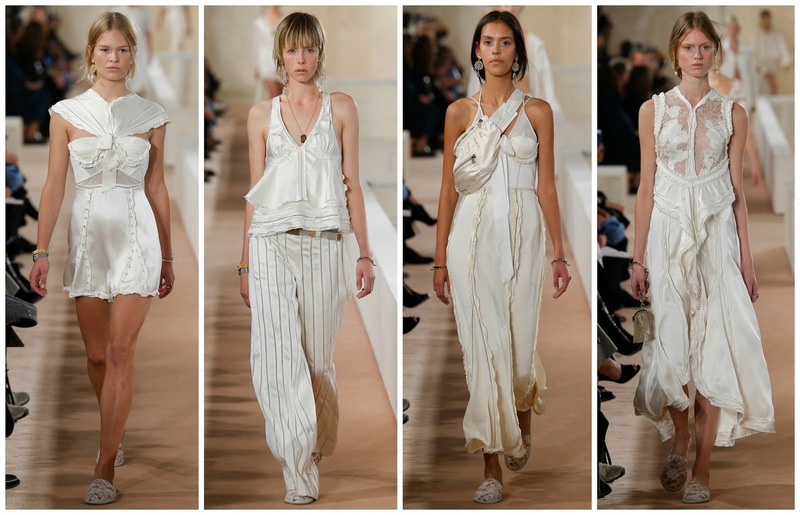 The show didn’t live up the exciting finality of it all, but when you watch 35 white dresses and 2002-esqe trousers take to the runway there’ll be a certain level of disconnect. Always one for surrounding himself with an enviable girl gang. The brightest young starlets whom Wang is famed for hanging with all took to the runway to support their friend. Bella Heathcote, Nicole Peltz, Riley Keough, Suki Waterhouse, Julia Garner, Sophie Kennedy Clark and Zoe Kravitz all marched the runway, some confidently, others awkwardly. Drawing the star power, the Wang Gang et al., is his forte, why not put it into full throttle for your swan song. A swan song provided ironic imagery in this collection. The white dresses, all as graceful as the swan, may not have been the most tantalising creations, though they piqued the interest of the audience. Well-constructed jackets, striped trousers, lace-touched dresses were all standouts in the collection. Lineisy Montero’s midriff-bearing dress with zipper-accents, and another silk slip dress with lace straps and a frilled bustier were two beautiful pieces. Subtle, unimposing, unexciting. The dearth of exhilaration was a polarising element in this collection. Alexander Wang’s Balenciaga goodbye was critically divisive. Some writers didn’t stress about it, delivering their reports with varying description of the 35-piece ivory, deeming their writing virtually inseparable from the next. That’s what this collection has managed to do. You will forever remember Alexander Wang’s final collection for this house, whether you thought it was vulgar and inappropriate or because of its sheer audacity. It certainly wasn’t his strongest display, but hey, it was fun while it lasted.